Only Purchasing the b001 Silver Metals Bag Can Get A White Cotton Packing Bag,Please Understanding. 1. Zipper, Clasps & Other Metals Are A Great Complement To The Leather. 2. Handle Is Strong And Sturdy With Generous Amount Of Leather, Which Gives It A Good Grip And Can Handle Any Amount Of Weight You Stuff The Bag With. 3. Shoulder Strap Is Reinforced With Heavy Duty Canvas, Adjustable To Accommodate Different Heights People. 4. Spacious And The Side Pockets Are A Great Added Touch For Anyone That Travels A Lot (Makes Reaching For A Passport And Phone Easy). What You Can Put In This Canvas Weekender Overnight Bag? - It Is The Perfect Size To Carry Your Family Clothes And Essentials For An Overnight Or Weekend Trip. How To Maintain The Leather Business Travel Bag? - Please Stored In A Dry Place When Not In Use And Clean It With Professional Leather Oil.Keep Away From The Long Time Big Sunshine. 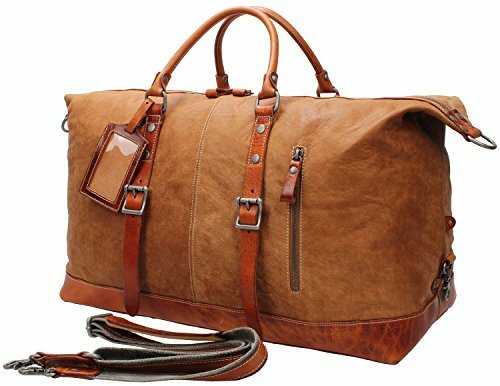 - If You Are A Frequent Traveler, You Will For Sure Appreciate This Type And Style Of A Bag! A Wee Bit On The Shiny Side But It Will Wear Down Nicely In Time. With The Difference In The Measurement Method, Please Allow 0.3-1.1 In Size Deviation. ✔ Material- Thick Genuine Leather Travel Bag,Solid Hard Rivet,Heavy Duty Cotton Lining And Threading. ✔ Dimension- The Large Garment Bag Is 21 In L X 9 In W X 14.5 In H,Perfect For A Couple Of Days Going Away. ✔Capacity- The Carryon Tote Bag Have Enough Room For At Least 3-4 Days Of Clothes And Other Electronics, It Fits In The Overhead Bins Nicely. ✔Packing Bag- 22 x 10.2 x 18 Inch,The Travel Bag Is Wrapped In A Large Reusable Tote Canvas Bags,Good For The Environment And Beneficial For You. ✔ Function- Convenient To Carry When Going Outdoor To Have A Travel Or Business.Casual Luggage Bag, Is Ideal For Weekend,Vacation Trip Or Other Daily Occasions.